Posted on November 12, 2018 by in Sports, Uncategorized and tagged #LadyPanthers, #Saegertownvolleyball. The Lady Panthers prepare for the upcoming match as a team. The Lady Panthers hit their way to a positive record, finishing the season 8-6, slightly improving on last year’s 7-7 record.The ladies had their final loss against Cochranton on Oct. 30 in the semi-finals of the D10 playoffs. Despite their losses, the ladies had positive feelings about the season. Claudia Fetzer, senior libero, believes that teamwork and hard work carried the team to semi-finals. “It’s been my best volleyball season yet due to our teamwork,” Fetzner said. Senior outside hitter Mikayla Balog agrees that this season has been the best of her high school volleyball career. Balog accomplished her personal goal of sixty 60 kills in an entire season. Cami Reynolds, senior outside hitter, said: “During the season I think we had the skill, but there were times when it was a hit or miss,” she believes that the team had the “push” they needed from Coach Johnson. The Panthers’ seniors: Mikayla Balog, Carlie Schlosser, Claudia Fetzner, and Cami Reynolds have become integral parts of the team and their losses will be felt by next years’ team. Junior Carmen Kantz and junior Kaylee Mulligan will lead the 2019 team as experienced players. Posted on October 15, 2015 by staceyanderton1	in News, Sports and tagged #Saegertownvolleyball, #Survivor. On Oct. 8, Saegertown Lady Panthers honored cancer survivor Ed Hess by raising funds for the Yolanda Barco Cancer Center. 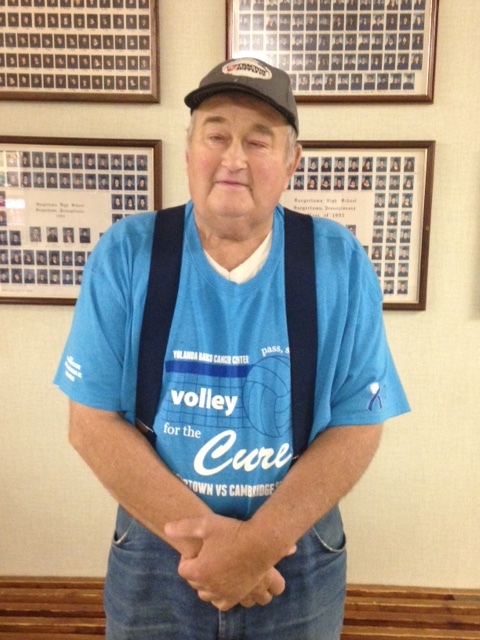 “Before the school was built, I drilled the foundation test holes,” said Ed Hess, who was honored at the Oct. 8 girls volleyball match at Saegertown High School. A long time Saegertown resident and grandfather of players Haley and Courtney, Hess survived pancreatic cancer, and the community came together to celebrate his life and raise funds for the Yolanda Barco Cancer Center. Before the match with Cambridge Springs, the Lady Panthers gathered with Hess for a ribbon-shaped photo to kick off the evening. Then Hess’s story was shared before the national anthem, and he was applauded by the crowd. Over $1000 was raised through a silent auction, 50/50 ticket raffle, and bake sale.